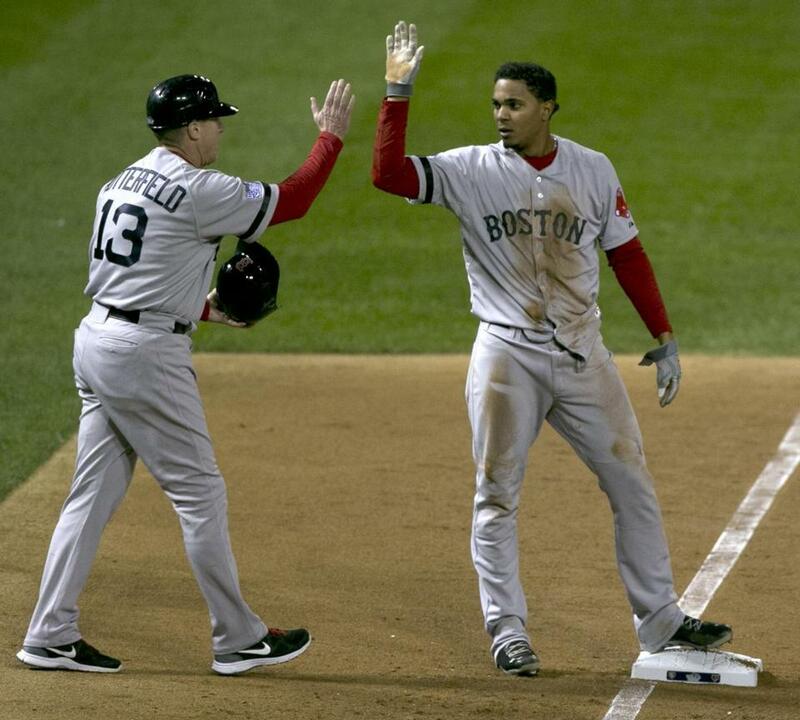 Red Sox Xander Bogaerts gets a high five from third base coach Brian Butterfield during game three of the World Series on Oct. 26. Brian Butterfield has received a lot of attention for his tremendous work with the Red Sox. At some point — and it’s probably already happened — he’ll get sick of being typecast as a coach. Butterfield wants to manage. In the meantime, his impact as a coach makes you wonder, just who are the best coaches in baseball? Every general manager will likely tell you his guys are. As a staff, it would difficult to top the Red Sox. While we asked a few GMs, we also asked players, writers, scouts, and other coaches, and here are the names we heard most often. We’re not saying these are the best, but certainly they have the respect of the people we asked. 1. Brad Mills, Indians — Terry Francona swears by him. Mills was Francona’s bench coach in Boston and third base coach in Cleveland, though Mills will shift to the bench this season. Mills is one of those guys who takes care of the dirty work, relays messages to the players, and usually sets up camp. 2. Torey Lovullo, Red Sox — He has received a lot of attention as John Farrell’s righthand man, and the results are obvious. Lovullo should get a managing job soon. 3. Larry Bowa, Phillies — He’s back to coaching in Philadelphia, and he has the reputation of being an outstanding lieutenant, strategist, and motivator. 4. Tim Flannery, Giants — People love Flannery’s style and approach to players. 5. Jerry Narron, Brewers — The former Red Sox bench coach is considered one of the best. His experience definitely helps the manager make tough in-game decisions. Like Mills, he does the grunt work for the manager. 1. Jim Hickey, Rays — Got a lot of mentions. Hickey is an imposing figure who commands the respect of his young pitchers. He’s turned prospects into bona fide major leaguers. 2. Mike Maddux, Rangers — Maddux gets the most out of what he’s got. He’s turned pitchers with varying degrees of talent into pretty good pitchers. He’s converted relievers into starters and vice versa, and many credit him with Yu Darvish’s successful transition to major league baseball. 3. Dave Righetti, Giants — Battle-tested with methods that work. Just look at his body of work with the Giants and the adjustments pitchers have made to go from troubled to successful. GM Brian Sabean always has thought Righetti is managerial material. 4. Don Cooper, White Sox — Pretty simple approach, pound the strike zone, be aggressive. He’s gotten his pitchers to buy into it. He’s also mentored Juan Nieves, one of the risers in the pitching coach ranks. 5. Roger McDowell, Braves — Many pitchers and coaches swear he’s one of the best. His pitching staffs have produced. 1. Dave Magadan, Rangers — He has reached the top respect level of his profession. Produced dramatic results in Boston and now in Texas. 2. Don Baylor, Angels — Love the fact he hates strikeouts and gets on hitters who shrug it off. He’ll have a tough task this year trying to turn Josh Hamilton around and getting Albert Pujols untracked. 3. Kevin Long, Yankees — Long is well-respected. Yankees hitters have gotten better under his tutelage. 4. Gregg Colbrunn, Red Sox — His grind-it-out approach worked famously, actually better than any team in baseball. 5. Chili Davis, Athletics — Hitters swear by him. The Red Sox had him at Pawtucket and let him get away. 1. Perry Hill, Marlins — Generally regarded as the best infield guy, using metrics and other new-age methods to get what many consider the best results in baseball. 2. Butterfield, Red Sox — Probably the hardest-working coach in the game. Constant positive reinforcement and instruction is off the charts. 3. Bobby Knoop, Angels — A long, proven approach to coaching infielders. 4. Luis Rivera, Blue Jays — Has been an excellent replacement for Butterfield. 5. Bobby Dickerson, Orioles — Taught Manny Machado to play third. Improved Chris Davis at first. 1. Rusty Kuntz, Royals — Kuntz’s outfielders are fundamentally sound and get great jumps on balls. Kuntz has been able to improve arm accuracy. 2. Arnie Beyeler, Red Sox — The Sox’ outfield was pretty sound defensively. Shane Victorino won the Gold Glove in right. Even Jonny Gomes, not noted for his defense, got better, as did Daniel Nava. 3. Dave McKay, Diamondbacks — Tony La Russa’s old coach did a great job with Alfonso Soriano when he was with the Cubs. 4. Davey Lopes, Dodgers — Considered one of the best base running coaches ever. 5. Dave Roberts, Padres — Quickly rising in the Padres’ organization. 1. Gary Tuck, Yankees — Tuck is back coaching and he automatically takes the top spot in this category. 2. Dana LeVangie, Red Sox — Just look at the progress Jarrod Saltalamacchia made from one year to the next. LeVangie, a longtime bullpen catcher and advance scout, made his first year on the coaching staff impactful. 3. Kevin Cash, Indians — Yan Gomes has become a pretty good catcher under Cash’s guidance. 4. Terry Steinbach, Twins — Strong on fundamentals. Has respect of players. 5. Bengie Molina, Rangers – He’s a Molina. ’Nuff said. Poise, confidence, and with a bright future? Matt Harvey is all of that. The Mets righthander, who is supposed to miss most of 2014 after Tommy John surgery, is hopeful of being able to pitch in September, but he’ll leave that up to the medical staff. Harvey is encouraged by the direction of the Mets, feeling the team has made good moves for the present and the future. “I’m looking forward to just getting to camp and being around the guys,” he said. Harvey went 9-5 with a 2.27 ERA in 26 starts last season. He had a 0.93 WHIP and started the All-Star Game in New York. Harvey, who hails from New London, Conn., and went to the University of North Carolina, said at the Boston Baseball Writers’ dinner how difficult it was trying to make it while growing up in a cold-weather climate. Harvey was in awe of new Hall of Famer Tom Glavine, who was honored at the dinner with the Judge Emil Fuchs Award for long and meritorious service to baseball. “When I checked into the hotel, Tom was in front of me,” said Harvey. “I knew he had over 300 wins but I re-Googled him just to take a look. You see he’s a 10-time All-Star and hundreds of millions of dollars later. When you’re a kid growing up you see those teams with Glavine, Greg Maddux, and John Smoltz, and you want to be like them. As a kid from New England, it’s a huge honor to be along side a guy like that and what he accomplished. Harvey had the surgery though nothing in the elbow was torn. He said there was stretching of the ligament, and the feeling was at some point he would have to have the surgery. Harvey decided he might as well have it done early in his career. 1. Here’s the way one GM handicapped the Masahiro Tanaka sweepstakes: Yankees $155 million, Cubs $120 million, Diamondbacks $120 million, Dodgers $119 million, White Sox $100 million, Astros $100 million. 2. When finalized, Matt Garza will have settled for $13 million a year from the Brewers on a surprising four-year deal. Many teams were leery of Garza’s medicals, but the average annual value of the deal made it attractive for the Brewers to make the commitment. The Brewers are building a very good rotation, which also includes Kyle Lohse, Yovani Gallardo, Wily Peralta, Marco Estrada, and Tyler Thornburg. 3. Arizona GM Kevin Towers indicated he and his staff were going to step back and give their young pitching a chance rather than go after free agents. The Diamondbacks went all out in their pursuit of Tanaka. Former Red Sox pitcher Mike Brown spent a lot of time in Japan scouting Tanaka for the Diamondbacks. Brown, who pitched in Japan, has a very good understanding of Japanese pitchers and their mind-set. The Diamondbacks came away convinced that Tanaka would be their ace if they could acquire him. But working against them was the fact they weren’t on one of the coasts and they were in a smaller media market. 4. The Blue Jays claimed the bidding for Tanaka was too high. This is a team owned by media mogul Rogers, which seems to have an endless flow of money, and yet it can’t afford to get into the bidding? As of this writing, the Blue Jays are still in need of two starting pitchers. With Garza off the board, now what? Bronson Arroyo remains the non-compensation alternative, but would the Jays take the plunge on Ervin Santana or Ubaldo Jimenez? 5. Stephen Drew makes so much sense for the Athletics with Jed Lowrie a better fit at second base. 6. If the Yankees acquired Drew, could they work a shortstop/DH platoon with Derek Jeter? 1. Grady Sizemore, OF, Red Sox — Nobody knows how he will perform, but the Red Sox were very impressed with his explosive movements. Sizemore looks much like he did when he was healthy. How long will he hold up? How good is he after missing two years of baseball? Those are the questions Sizemore will have to answer in spring training. Sizemore also had a major league invitation from the Reds, but decided the Red Sox afforded him the best opportunity to win a starting job with Jackie Bradley Jr. the competition. 2. Yenier Bello, C, Cuba — Bello, who has been cleared by the Office of Foreign Assets Control, could become the next big Cuban to come to the majors. With the Red Sox pleased with their young catchers, it’s likely Bello will sign elsewhere. He can hit for power and is a decent overall hitter. The Dodgers, Cubs, and Athletics always seem to be in the mix for Cuban players. 3. Grant Balfour, RHP, Rays — The Rays made yet another smart signing when they got Balfour back after the rival Orioles backed out of a deal because of medical concerns. Balfour had an excellent season as Oakland’s closer and returns to Tampa Bay on a two-year, $12 million deal. Balfour is AL battle-tested and should provide the Rays with a dramatic upgrade at the back of their bullpen. 4. David Ortiz, DH, Red Sox — Ortiz has a great fan in agent Scott Boras, even though Boras doesn’t represent him. Boras feels Ortiz has been underpaid considering his production. Boras represents Kendrys Morales, who hasn’t been able to find a job. Morales is being promoted as a first baseman, but most teams see him as a DH. Boras notes that Ortiz continues to be Boston’s featured power hitter as a DH. His message is Morales can also be a valuable hitter as a DH in a top lineup. 5. Daisuke Matsuzaka, RHP, Mets — The Mets liked what they saw from Matsuzaka late in the season and they have invited him back on a minor league deal with an invitation to major league camp. Matsuzaka is 33, and there had been some talk that he might go back to Japan to pitch. But the possibility of breaking into the Mets’ rotation with Matt Harvey out intrigued Matsuzaka enough to fight for a spot. Matsuzaka (3-3 with a 4.42 ERA in seven starts for the Mets) upped his tempo quite a bit late in the year to where he was no longer a human rain delay. Those who know him say he’s determined to show the form of his first two seasons with the Red Sox. 6. Stephen Drew, SS, free agent — Drew remains one of the best players out there in free agency. Hard to believe a good shortstop isn’t in demand. The Red Sox are publicly saying they’re fine going with Xander Bogaerts at shortstop, but they would love to get Drew back. The Yankees, Mets, Athletics, and Red Sox are possible fits. With spring training around the corner, there could be a team or two that changes its mind if Drew can be had on a one-year pillow deal. 7. David Price, LHP, Rays — What we don’t know is whether the Rays have had a change of heart about dealing Price, but it sure sounds like it if you listened to manager Joe Maddon last week. “Right now, David’s a Ray, and I hope he stays a Ray, quite frankly,” said Maddon. “Love him, love having him. We keep talking about all of these different components within the clubhouse that make a difference. Who makes more of a difference than he does?” The Rays could very well stay with Price, see where they are at the trading deadline, and either go for it with him or deal him then. The Rays have spent a bit more money than usual this offseason. 8. A.J. Burnett, RHP, free agent — Burnett has yet to decide whether he’s returning to Pittsburgh or retiring. The Pirates probably won’t go after a pitcher if he does retire. Right now, the Pirates are looking for a full-time first baseman and would use the Burnett resources toward that end. The other wild card is the Orioles. Burnett lives in Baltimore. 9. Pablo Sandoval, 3B, Giants — As GM Brian Sabean said, “Perhaps his pending free agency might be his best medicine” for losing 42 pounds this offseason. Sandoval is showing off his new body in the Venezuelan Winter League. The Giants have been through a lot with Sandoval concerning his weight. Even if he has a good season, this may be his last with the Giants. From the Bill Chuck files — “Last season, B.J. Upton had 5.8 times as many strikeouts as RBIs (151 Ks/26 RBIs). He is one of three players in baseball history who played at least 125 games in a season with a ratio that bad. The other two were Gary Pettis (124/17 in 1987) and Tommie Agee (103/17 in 1968).” Tomorrow, wish Ken Huckaby (43), Phil Plantier (45), and Eric Wedge (46) a happy birthday.